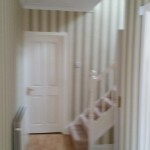 Just finished makeover of Hall, Stairs and Landing, Bray. The Clients wanted to keep the hall as bright and light as before but to spend as little money as possible and get the greatest effect. 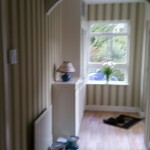 So we chose a classic stripe wallpaper in rich cream, olive and gold. It was a total change but retained the open feeling and added an elegance that had not been there before. Like what you see? 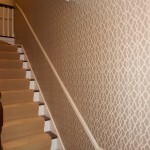 Want a quotation? Got a question? Email me here.